Weighted Blankets for Insomnia: A Magical Cure? Or Are They Just Hype? Disturbances in sleep, including chronic insomnia, can negatively affect your family life, well-being, and overall daytime productivity. Whether it’s anxiety-driven or medically related, a sleep disorder is no fun to deal with. If you’ve ever taken prescription sleeping pills, you know how horrible their side effects can be. No wonder, many insomniacs try more natural ways and sleeping under a weighted blanket is one of them. If you’re at the point of desperation and you’re considering investing in a weighted blanket to treat your insomnia, read this article first to be sure this is something that can help you out. 2 But Will A Weighted Blanket Help You Have A Better Quality of Sleep? 4 Are You a Restless Sleeper? Why? 5 Is it Safe to Sleep Under a Weighted Blanket? Every one of us has trouble falling asleep every now and then, and you’re no exception. However, if you can’t sleep at night or it takes several hours before you finally catch some Zzz’s, you might be suffering from a sleep disorder called insomnia. It’s a complicated condition that many researchers keep studying in order to determine the exact causes of it. There are two types of insomnia – acute and chronic. The first one is brief and occasional, and usually occurs due to some stressful life events. Acute insomnia doesn’t need any medical treatment, albeit some natural methods can be used to treat it. Chronic insomnia is a more complicated condition where disrupted sleep happens at least 3 to 4 nights per week, and you’ve been suffering from it for more than 3 months. Chronic insomnia can include a wide range of treatments, including relaxing yoga, sleeping under a weighted blanket, drinking herbal teas, etc. Weighted comforters are the latest trend right now, and there’s a reason for it. But Will A Weighted Blanket Help You Have A Better Quality of Sleep? A study published in Occupational Therapy in Mental Health involved 32 adults and showed that 63 percent of them experienced reduced anxiety and better sleep after sleeping under a 30-pound blanket. Another study posted in Australasian Psychiatry reported that psychiatric patients who slept under heavy blankets had a much lower stress level than those who refused to use it. Heavy blankets create an “earthing” effect1 that helps to push you downward, lowering the cortisol levels. Cortisol is the stress hormone that can negatively affect your sleep. A weighted blanket acts almost like a relaxing massage, mimicking deep pressure touch and helping you relax faster. If you suffer from acute or chronic insomnia, calming your mind and taming your negative thinking at night is a real challenge. A heavy blanket is usually associated with a warm feeling such as a hug and causes a sense of security. This leads to a more relaxed mind and less anxious thoughts. When the pressure of the blanket is slightly applied to your body, it stimulates the serotonin production. The serotonin converts to melatonin, which signals your brain that it’s time to rest. Plus, such pressure can help you stay asleep during the night, getting enough healthy sleep. I can say without a doubt, that whenever I sleep under my heavy blanket, I can feel the difference the next day. It’s probably not just something psychological, as I think it’s impossible for me to wake up during the night, which does happen about half of the days I sleep without it. Another important thing to say, Is that when I wake up in the morning, I don’t feel tired at all, I feel like it takes me about 1 minute of diziness and then I can get up and start my day just like if I had an energy drink while I was sleeping. Yeah, It’s that crazy. And I totally love that feeling. But I have to say: I cannot tell this is going to be your case, after all the research I’ve done, there are mixed opinions. Some people say that it works just as I feel it does, and some others just think that weighted blankets are pointless, or even uncomfortable to them. The only thing you can actually do to be sure, Is to try them out, and feel it for yourself. In this article, I provide some useful tips If you want to try weighted therapy without buying a weighted blanket. Are You a Restless Sleeper? Why? There are tons of possible reasons for restless sleep, including your medical conditions, lifestyle choices, sleeping habits, and even bedding choice. The other causes are aging, a feeling of excitement, a depressive bedroom, too much stimulation before sleep (think of exercising, playing video games, or watching television), drinking too much caffeine, and noise disturbances. Some causes are less serious and can be improved with a better self-care and healthy habits, while others require a special sleep blanket or/and a medical attention. Sleeping under weighted blankets regularly helps to promote relaxation and break the cycle of sleep disturbances, including chronic insomnia. Often compared with regular snoring, sleep apnea is a serious condition that is characterized by loud snoring in which your breathing stops repeatedly and begins as you sleep. People with sleep apnea tend to suffer from chronic fatigue, poor sleep, and a number of other health issues. You may be unaware of the fact that you have sleep apnea and believe that your low energy and bad concentration are because of your busy schedule. However, sleep apnea can cause the chronic sleep deprivation that typically results in slow reflexes, daytime sleepiness, poor concentration, low productivity, and a higher risk of accidents. If left untreated, chronic sleep apnea can lead to depression, heart disease, diabetes, liver problems, and other more serious diseases. Gasping, snorting, or choking during sleep. Sleep apnea requires a medical treatment, albeit there are some other additional things that can help you ward off or reduce the symptoms of it. Sleeping under a weighted blanket can be one of them. Of course, the blanket can’t solve this health problem, but it can help you get a more quality sleep and thus function better during the day. The most important thing is to choose the right weight so that you don’t feel suffocated in your bed. Restless legs syndrome (RLS), also known as Willis-Ekbom disease, is characterized by discomfort and twitchiness in the legs, especially during the nighttime. RLS is one of the leading causes of chronic insomnia. The high stress levels worsen the symptoms of RLS. That’s why it’s vital to reduce your stress before and while you sleep. Meditation, yoga, and a warm bath will calm your body before going to bed, while a heavy blanket can help you sleep better and feel relaxed during the night. A deep pressure touch stimulation provided by a weighted blanket aids in soothing the pains and discomfort of RLS that make the nighttime highly stressful. Additionally, it helps to relieve the heaviness in your legs, preventing the midnight awakening. You should also sleep in a quiet, cool bedroom, decrease the amount of the light you’re exposed to for at least an hour before sleep, and avoid drinking alcohol. Your doctor may prescribe a magnesium or iron supplement, too. Is it Safe to Sleep Under a Weighted Blanket? As I mentioned earlier, sleeping under a weighted blanket can help you treat both types of insomnia along with a number of conditions that cause sleep disturbances. Unless you choose the wrong weight, a heavy blanket is safe to use and it does offer plenty of health benefits. The pressure of the blanket reaches deep within your body and provides a comfortable environment for you to be sound asleep in. The physical connection that you feel with the blanket, as well as the sense of being swaddled and hugged, make you feel warm, safe, and comfortable. Using a weighted comforter on a regular basis helps you keep your stress levels at bay, ensure your mind is at ease, and allows your body to be ready to rest when the bedtime calls. The constant state of tranquility aids in taming overthinking and promoting a good night’s sleep. Moreover, weighted blankets help to stimulate the production of the ‘sleep hormone’ called melatonin. The chemical is produced by the pineal gland in the brain and the production of serotonin. The lack of serotonin leads to anxiety, depression, and sleep disorders. Most importantly, it leads to a poor production of melatonin and chronic insomnia. The therapeutic benefits of the heavy blankets are enormous as they provide a firm yet gentle pressure on your body by inciting your receptors. This change will ensure that your mind and body believe that you are safe and secure and thus can sleep peacefully. 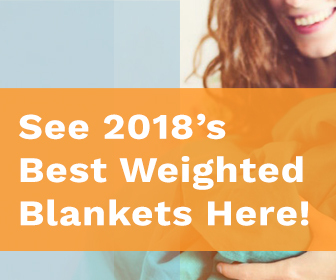 Apart from helping with sleep disorders, weighted blankets can help you boost your cognitive function, overcome the oversensitivity to touch, tame your anxiety, and provide a sense of security. It’s crucial to realize that a weighted blanket isn’t a magic stick that will beat your chronic insomnia quickly. There are many factors to consider when choosing the correct one for you, so do your own research. Sleeping on the blanket that is too heavy for your body can cause more harm than good. An additional tip to consider, never place a heavy blanket on top of your face or head – people with insomnia are guilty of it – as it can stimulate a suffocating sensation and cause even more sleep disorders.